Diamond Chain Jigs are great in all situations where predatory species like bluefish and striped bass are feeding on sandeels. Daddy Mac Diamond Chain Jigs are great in all situations where predatory species like bluefish and striped bass are feeding on sandeels and other small baitfish. 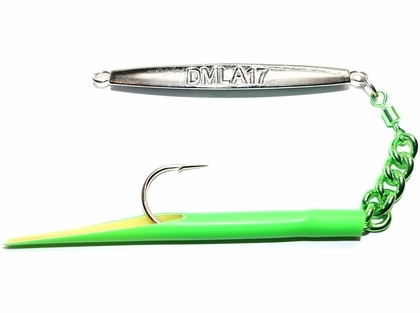 Featuring a 7/0 Gamakatsu stainless steel Siwash hook, and a metal chain linking to the jig, resulting in a super durable jig that will take any abuse you can throw at it!